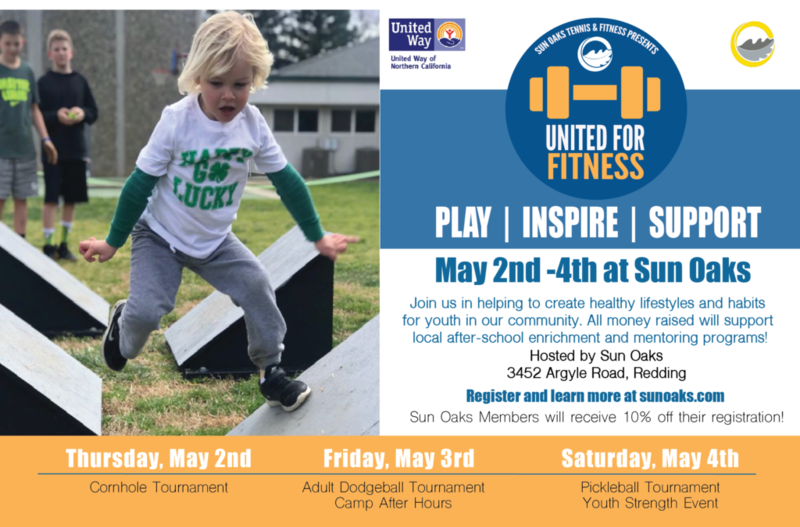 Sun Oaks Tennis & Fitness and the United Way have teamed up for United for Fitness, 3 days of activities for the whole family! Good health is both a community responsibility and a community benefit. It goes beyond personal diet, exercise and the many other individual choices we make. The foundation for a healthy life is in the neighborhoods we build and environments we inhabit. This event is focused on creating healthy lifestyles and habits for youth in our community. When our residents have access to quality foods, exercise and strong pathways, they are more likely to succeed in school, work and life. All money raised will support local after-school enrichment and mentoring programs funded by United Way, including Catalyst Mentoring, Anderson Teen Center, Shasta Family YMCA, Shasta Union High School District and Sun Oaks youth initiatives like The Ascension Project.